Choose the Euramax Canada Traditional-Style Gutter System to channel and redirect rainwater runoff to prevent erosion and costly foundation damage. The 2 in. x 3 in. Vinyl A Elbow has crush- and dent-proof vinyl construction for durability. Use it to redirect downspouts parallel to the wall to help prevent garden erosion and foundation damage. This A elbow is designed to withstand extreme temperatures and can be used with metal and vinyl downspouts. Traditional 90 outside corners change direction along gutter lengths. No sealants or caulking required! Joiners required to connect corners to gutter lengths. Durable vinyl! Engineered to withstand North America's worst conditions (-40? to 150?F or 65?C). Heating cables ok. Maintenance-free! Never needs paint! Cleans with a hose! Elbows Traditional B White Vinyl Choose the Euramax Canada Traditional-Style Gutter System to channel and redirect rainwater runoff to prevent erosion and costly foundation damage. The 2 in. x 3 in. Vinyl A Elbow has crush- and dent-proof vinyl construction for durability. Use it to redirect downspouts parallel to the wall to help prevent garden erosion and foundation damage. 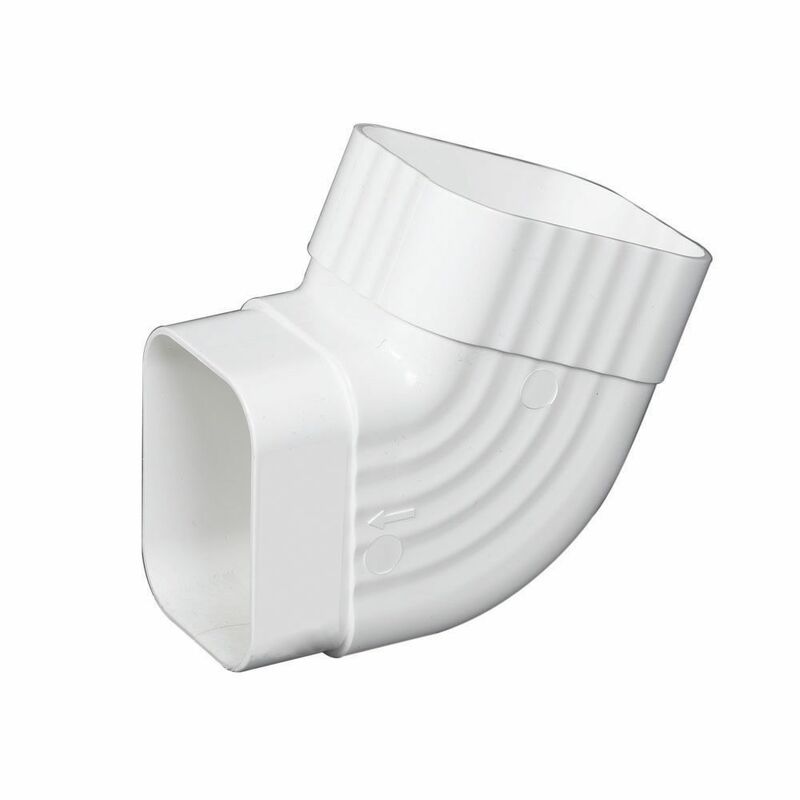 This A elbow is designed to withstand extreme temperatures and can be used with metal and vinyl downspouts. Elbows Traditional B White Vinyl is rated 5.0 out of 5 by 1. Rated 5 out of 5 by Sully from Perfect product for my application Doing some container gardening this year and I needed to install a rain barrel watering system. Two of this product connected proved the perfect section for redirecting rain gutter downspout water to my rain barrel.